I’ll keep this one light as you focus on catching up on all the emails you missed over the holiday – or maybe you need a distraction (there’s comfort in stillness). We published every weekday through the holidays so take a minute to follow up on those articles (a list and summary at the bottom). But if you want to keep reading, this is what we have in store for you today: the Bike Fancy catalog of interviews. Jennifer and sons at Cortland Street and Paulina Street. Read their interview. Photo by Martha Williams. 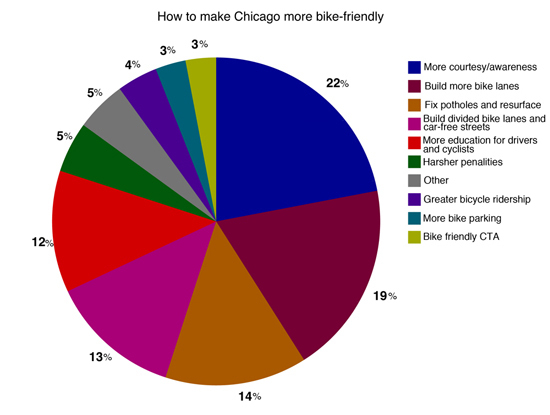 I emailed Martha a while ago and suggested she use the rich data she had in the personal interviews she conducted with Chicago’s citizen cyclists. Data that can be used to help guide development of bikeway planning (similar to what the Streets for Cycling 2020 Plan is doing). So I gave her some tips on how to put it together and two days ago she published the results. The number one topic is “more courtesy/awareness from both drivers and cyclists”. Read the full post for more information, and for key quotes from some of the interview subjects. This isn’t the only new bit of data. I recently updated our About page where there’s a table of commuting statistics for quick and easy reference. The United States Census Bureau recently released the most recent data from the 5-year American Community Survey. It’s designed to be just as accurate and broad as the decennial census, but new, overlapping 5-year sets will be released annually. Right now there are two 5-year sets. Aside from the occasional counts the city or Active Trans/Chicago Park District do, its the most reliable and consistent count and even breaks it down into men and women. Sample size 1,219,311 1,267,895 1,192,139 Workers 16 and older (who had a job at the time of survey). Are you a data junkie like me? Check out our previous articles on crash data as well as on my personal blog, Steven Can Plan. If you ever have data questions, please don’t hesitate to leave a comment or contact me. In case you missed them (is this saying we don’t take breaks?). Bypass the Chicago/Halsted/Goose Island detour by taking the riverwalk. We should be experimenting with new street designs. It’s only been for New York City’s benefit. Is anybody actually using Chicago’s new pedestrian safety flags? John talks to people on the street about the orange flags at 10 intersections. Chicago Transit Authority doing well in exploration to communicate over social media and social network.